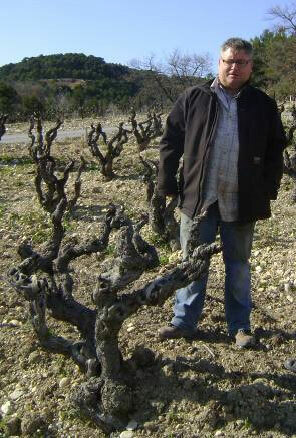 Vines are traditionally pruned close to the ground in the Southern Rhône to protect them against the fierce northerly wind known as the Mistral, which can exceed speeds of 100km/h. However, this method of vine training requires both skill and dedication, and makes machine harvesting complicated, so the trend in the region has been to train the vines on wire, especially at the larger estates. That is not the case at Helen Durand’s Domaine du Trapadis, founded in 1850 and still a traditionalist in a region which has changed rapidly. Helen prefers the old pruning systems, and eschews the aid of synthetic fertilisers, herbicides and pesticides, believing that his hard work pays off in terms of greater biodiversity in this vineyards. Despite his serious attitude to both viticulture and vinification, Helen is jovial and full of (often self-mocking) quips in person. It is also no surprise, given how closely he shepherds the berries from vineyard to the cellar and eventually into the bottle, how much his wines resemble him – cheerful, sunny and toothsome Grenache-based wines well-rooted in the land, its people and their traditions.